Durga Puja is here and along with rest of Assam, the celebrations also began in Darrang district with a five-day long programme. On Tuesday, Mahasaptami was celebrated with fervour and traditional gaiety. Few more community pujas have been added this year – Udayan Sangha at Ward No 1, Mangaldai and Tribeni Anchalik Sangha at Mudoibari along the Udalguri border. This year, nearly 190 Durga pujas are being held in Darrang district – from 184 last year – an increase of six. The increase ratio of pujas is, however, less this year in comparison to the previous year – previous year the figure had gone up to 184 from 2016’s figure which stood at 170. According to the administrative branch of the Deputy Commissioner’s (DC) office in Mangaldai, Mangaldai Sadar Police Station has recorded the highest numbers of pujas – 74, followed by 54 under Kharupetia Police Station. This includes three separate historical puja of the Royal Koch dynasty at Gakhirkhowa Raja Howli, Dangar Raja Howli and Mohanpur Howli near Mangaldai started by the Koch king Dharma Narayan nearly 400 years back. The significance of these royal pujas is that the face of Goddess Durga is smeared with red colour symbolising the deity as a warrior. 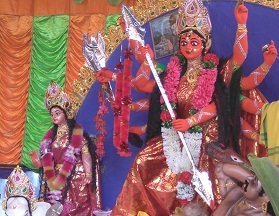 Moreover, the common people are not allowed to take part in the first two days of celebrations i.e, on Mahasaptami and Mahaashtami – as these two days of celebrations are kept reserved for members of the royal family while Mahanavami puja is thrown open to the masses and no royal family members attend. Kumar Dinendra Narayan Deb, one of the members of the royal dynasty, informed that puja celebrations in all three ‘Howlis’ have been going on in a traditional manner since ages and the pristine glory has not been lost. Animals are sacrificed before the deity only at Gakhir Khowa Raja Howli. “Buffalo, goats, ducks, etc., will be sacrificed on the day of Mahaasthami at Gakhir Khowa Howli,” Deb shared. Besides the ‘royal’ pujas, there are several other community pujas in the district -Mangaldai Barowary Puja near Natya Mandir, Awlachouka Sarvajanin Durga Puja at the Awlachouka United Club, Ramhari Sarvajanin Durga Puja, Chapai Durga Puja, Durga Puja at Hanuman temple in Kharupetia, Durga Puja at Tiger Club, Kharupetia, etc. These committees have been celebrating puja for the last 25 to 100 years and have been pulling crowds by the horde. The Darrang district civil and police administration has, meanwhile, made elaborate arrangements for smooth immersion ceremony of the idols of Goddess Durga on Friday. Accordingly, four immersion places along the River Mangaldai, River Tongani, River Bornadi at Dumunichuki and River Nanoi at Dolonghat have been notified by the administration with adequate security vigil, stated official sources. Restrictions have been placed on traffic movement in the busy streets of Mangaldai town as well as in Kharupetia.